The Sustainability Office provides tools, training and resources to build leadership capacity for sustainability actions across the campus. 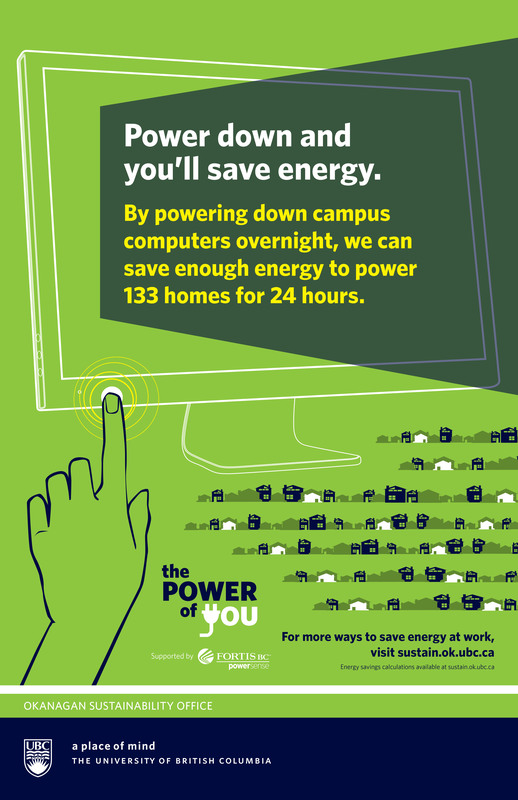 Each of us has a role to play in contributing to campus sustainability. Individual actions can lead to collective impacts that make a difference. Contact us for more information or to get involved. Every action counts! 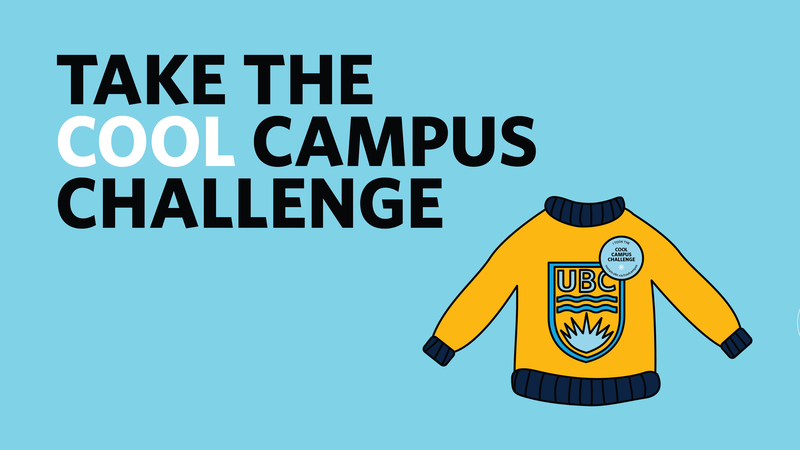 Help conserve energy as part of UBC Okanagan’s team in the BC Cool Campus Challenge, a fun and friendly initiative between BC universities and colleges to save energy this winter season. Click here for more information and here to take the Pledge. 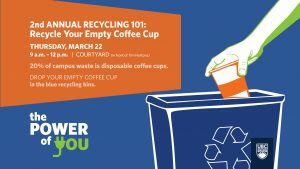 At UBC’s Okanagan campus, single-use coffee cups account for the highest amount of accepted recyclable material found in the waste and recycling streams*. 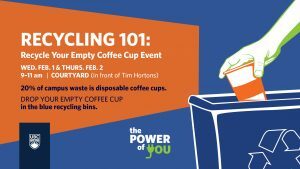 *The 2018 Bi-Annual Waste Audit, commissioned by UBC Okanagan’s Facilities Management department, reported that of the 80% of the divertible material found in the waste stream, 21% was made up of single-use coffee cups. The recycling stream audit demonstrated that single-use coffee cups were listed as the top material recycled at 38%. Improvements to these audit figures can be easily achieved through proper sorting habits applied at the recycling stations found around campus. Laboratory activities can have a huge impact on the environment. 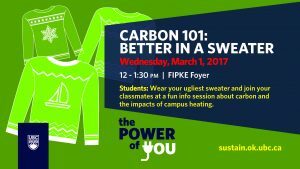 Join your colleagues, classmates, the Sustainability Office, Campus Planning & Development, and Risk Management Services to learn how to labs can reduce their impact on the environment through energy conservation and the reduction and diversion of waste. Laboratory recycling, hazardous waste management, energy reduction, green chemistry, Styrofoam management, water use, re-use, consumable reduction, water protection and any other ideas you might have on reducing laboratory impact. * Pledge to reduce your impact * Enjoy a coffee – remember your mug! Every action counts! 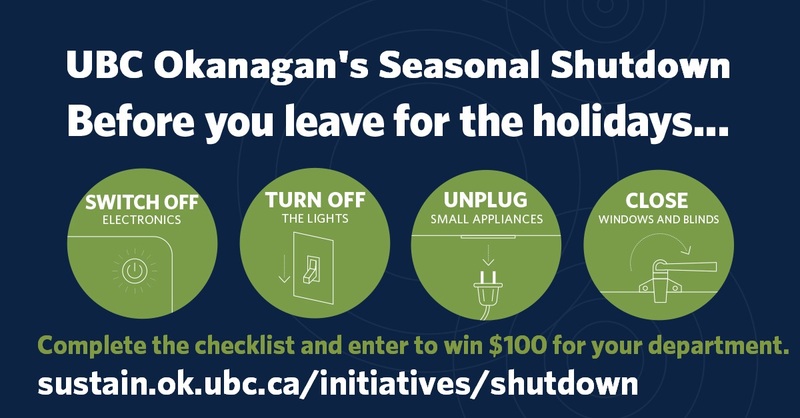 Help save energy as part of UBC Okanagan’s Seasonal Shutdown, which lowers the temperature in buildings over the winter break to reduce energy use and emission on campus. Click here for more information and to download the checklist . 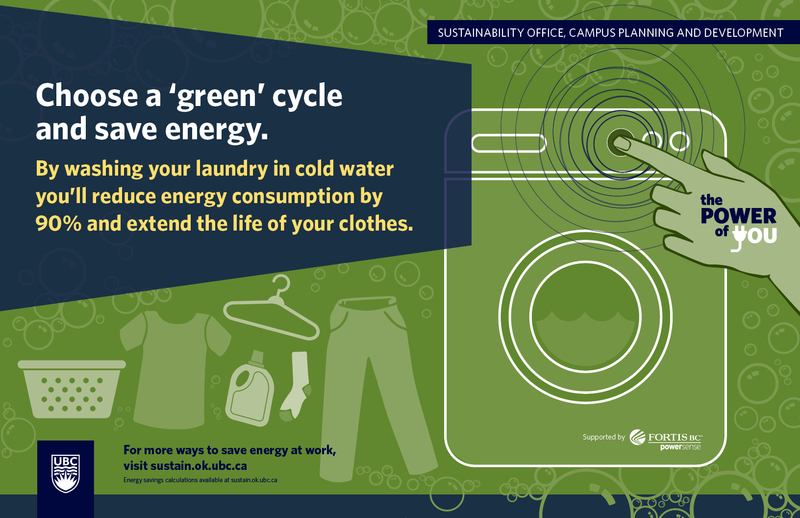 UBC’s Okanagan campus residents are encouraged to wash their laundry in cold water. 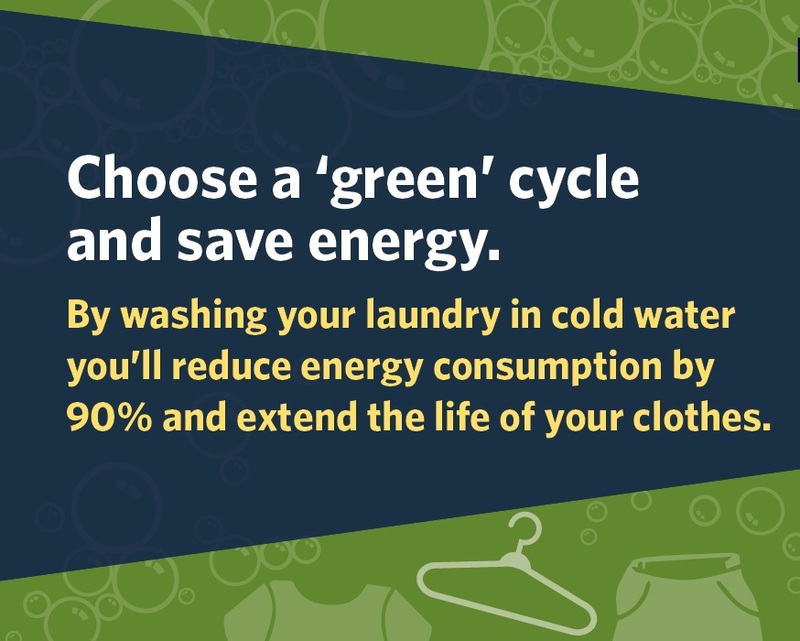 By implementing this action you will reduce energy consumed by washers by 90% and extend the life of your clothes. Click here for more information. *The 2016 Bi-Annual Waste Audit, commissioned by UBC Okanagan’s Facilities Management department, reported that of the 78% of the divertible material found in the waste stream, 31% was made up of paper products, which includes disposable cups. Similar statistics appeared within the recycling audit, which demonstrated that paper products were listed as the top material recycled at 30%. Improvements to these audit figures can be easily achieved through proper sorting measures applied at the recycling stations found around campus. 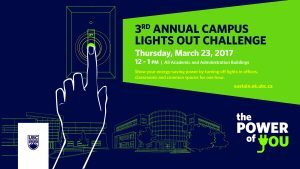 In support of 2017 Earth Hour, UBC Okanagan is hosting the campus’ 3rd Annual Lights Out Challenge. 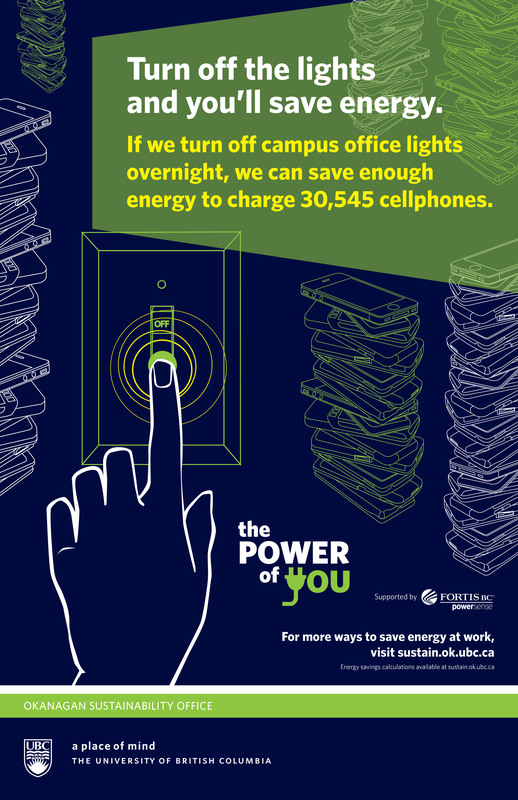 Conserve energy by turning off lights in unoccupied spaces. Even flipping a switch in a space with occupancy sensors can save 30 minutes of energy consumed by unnecessary lighting. 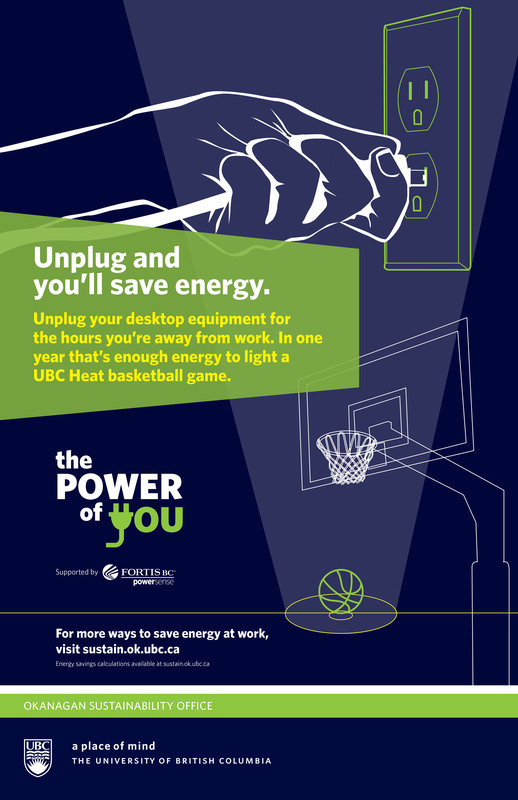 No Sign-up or Registration Required: Participation is as easy as turning off the office light when leaving for lunch and by flipping a switch when leaving a classroom, laboratory or residence. Which building will show the greatest energy reduction during the one-hour challenge? Or have the most occupant participation? Participate on March 23 and tune in to find out! 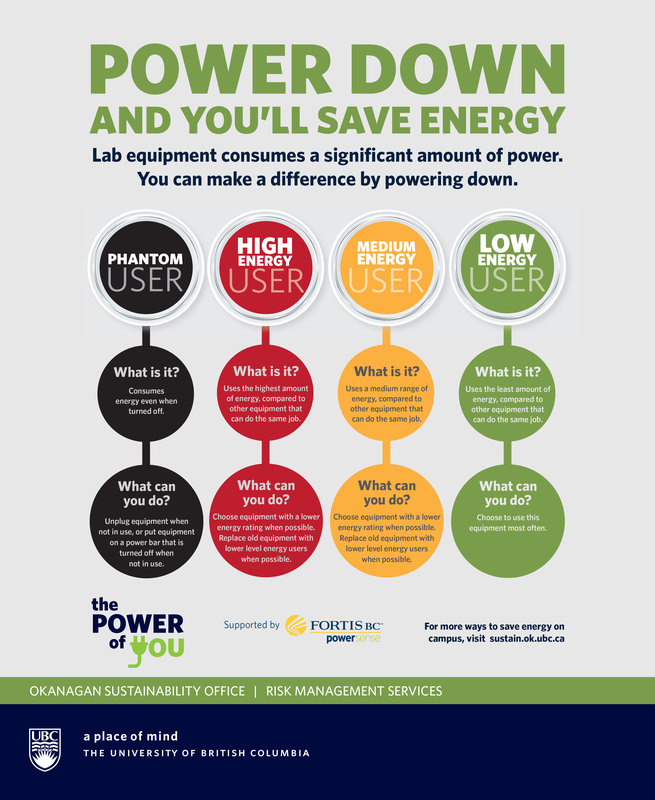 Results will be posted on the Power of You website following the initiative. At UBC’s Okanagan campus, the student residence buildings consumed 4,610,013 kWh, or 2,858.10 kWh /resident, of electricity in 2016. Of this, 63% or 2,937,076 kWh can be attributed to energy required to heat resident spaces. 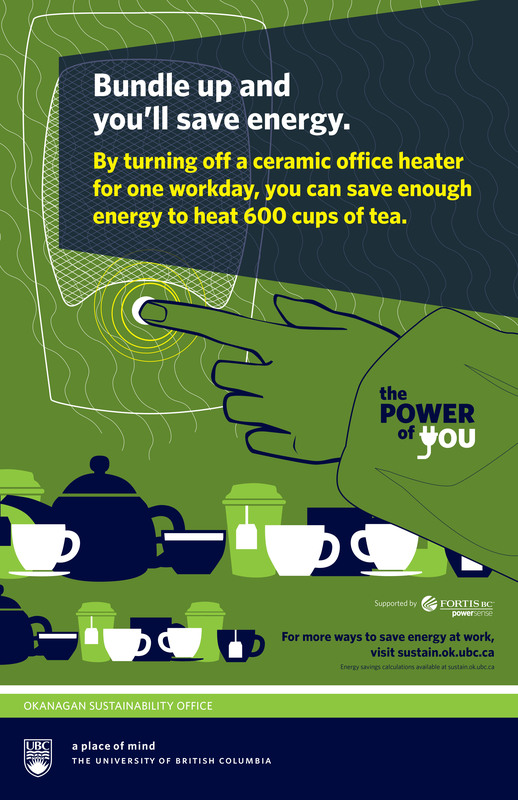 By turning your thermostat down 2oC* and putting on a sweater, each student can conserve enough energy to make 15 cups of coffee per day**. * BC Hydro: reduction of 2oC can reduce electricity bill by 5%. ** Based on electricity consumption of a generic drip coffee pot. Laboratory activities can have a huge impact on the environment. Have a coffee with the Sustainability Office, Campus Planning & Development, and Risk Management Services and learn how to reduce the impact of your research on the environment.